Cork is the largest county in Ireland so there is much to explore. Whilst dominated by the city of Cork, this area also provides a delicately carved coastline, medieval castles and historic monuments as well as an abundance of hedge-lined rural roads ideal for a driving holiday. 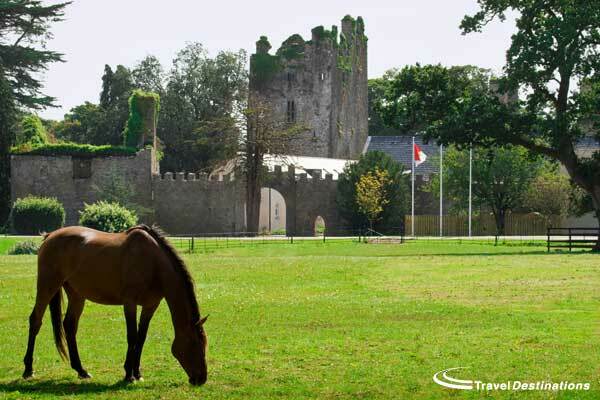 Our home to explore this area will be Castlemartyr Resort, where a grand 17th century manor house and an 800-year-old castle ruin are just a few minutes’ walk from your bedroom. Depart on the morning ferry from Holyhead to Dublin (routes from Fishguard to Rosslare are also available). Once in Ireland we drive south to Castlemartyr in County Cork. The 5-star Castlemartyr Resort will be out base for the next 5 nights. An informal welcome BBQ/buffet has been arranged in the evening within the hotel’s grounds. Taking in some of the areas unique heritage, our first driving route takes us initially to Fota House and gardens. A guided tour of this 19th century stately home will show some exquisite plasterwork and well-preserved paintings as well as telling a story of life as a servant or member of the gentry when the house was privately owned. As well as the house you will be able to tour the Victorian working garden and wander the grounds of the arboretum. From Fota House it is a short drive to the town of Cobh; the last stopping point of the ill-fated Titanic. Here you can immerse yourself in the excellent museums, join a boat trip to Spike Island in Cork Harbour, or stretch your legs to climb the hill to the magnificent cathedral the overlooks the town. The rural roads of East Cork’s hinterland take us to the borders with Waterford and Tipperary. Today’s road run takes us along hedge-lined roads beyond Lismore Castle to the Vee Pass; providing stunning views of the Knockmealdown & Galtee Mountain ranges. Today’s road run takes us along the coast visiting blue flag beaches and seaside towns along the way. The blue-flag beaches at Ballycotton and Whiting Bay can provide an opportunity for a paddle or swim whilst the fishing port at Dungarvan overlooks a natural harbour and provides and ideal lunch stop. The walled town at Youghal also provides a convenient stopping point where you will be able to drive under the historic Clock Gate Tower. A group dinner has been arranged in the evening at the hotel’s Capel Suite. There is a choice of options to fill your day depending on how much you wish to drive & see. It is possible to drive in to the historic centre of Cork city. Once parked you can visit the City Gaol, St. Finn Barre’s cathedral and the bustling English market all on foot. Others may prefer the short drive to Midleton to take a tour at Jameson’s whisky distillery. A longer alternative would be to drive to Blarney to kiss the famous stone and shop at the retail outlets that neighbour the site. Alternatively, you may prefer to take a stroll in the hotel grounds, swim in the hotel’s pool or take a spa treatment on-site. The choice is yours. This tour ends after breakfast as everyone heads back to the ferries for the afternoon or evening sailings and the journey home.